July 4th may be going down on a Wednesday this year, but we’ve got just what you need to start off the festivities. Get ready to party into midnight aboard the amazing Odyssey Yacht with our Chicago party cruise! This Chicago party cruise is going to start off your July 4th with a sail through the Windy City and music and drinks. This massive yacht is about to get your July 4th started right as you get ready to IndepenDANCE into July 4th on the seas! The Odyssey Yacht is a beautiful yacht that’s perfect for you and your friends to party on. This yacht has three LED lit and climate-controlled decks that you and your friends can enjoy. The spacious Odyssey Yacht will treat you to amazing views of the city from the inside yacht or its outside observation deck. Take in the views of the midnight sky and the city skyline while you party into July 4th. Set sail into midnight with your favorite hits of the year as our live DJ keeps them blasting into the early morning hours. Dance to your favorite Top 40, Hip-Hop, Dance and Pop hits while you enjoy breathtaking views of Chicago. Take in the views and move your body and make sure you get a drink in your hand! Our Chicago party cruise will keep your favorite drink pouring all the way into the morning with our fully stocked cash bar on board. All night long your favorite drinks will be pouring as you celebrate July 4th early. Pour up your favorite drinks with your friends and dance the night away as you enter July 4th with an unforgettable celebration! 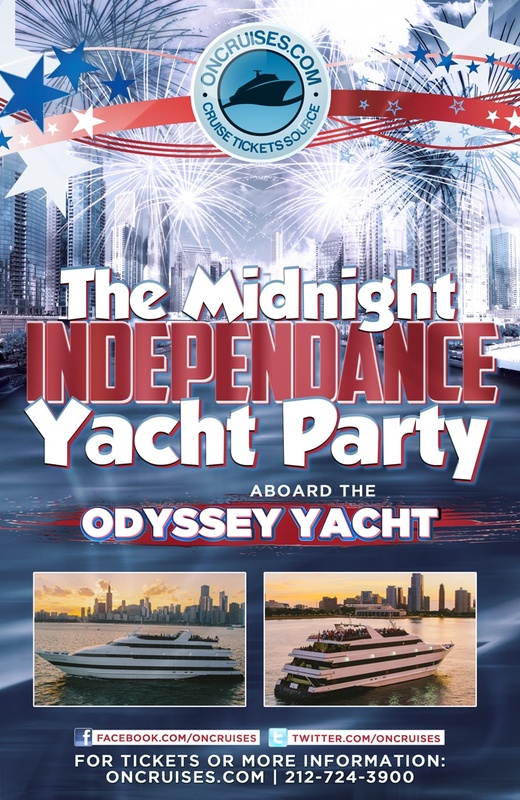 There’s no better way to start off your July 4th than with us aboard the Odyssey Yacht. Book your tickets aboard today and start off July 4th right with our unforgettable Chicago party cruise!